Goodness, it is pretty well a year since I blogged. I had sorted of decided to not bother anymore, but lately I’ve been thinking that maybe I should do it after all. It so often seemed too difficult, by the time I found my camera and hooked it up to the PC, and copied photos over to the PC etc. And that’s if no-one else was using the PC when I wanted to. But I think it may well be easier on my iPad – take the photo, open the app, type my post, insert photo, and it’s done. Well, we’ll see. I shall do a few posts and see how it works. So. What to start with?………. 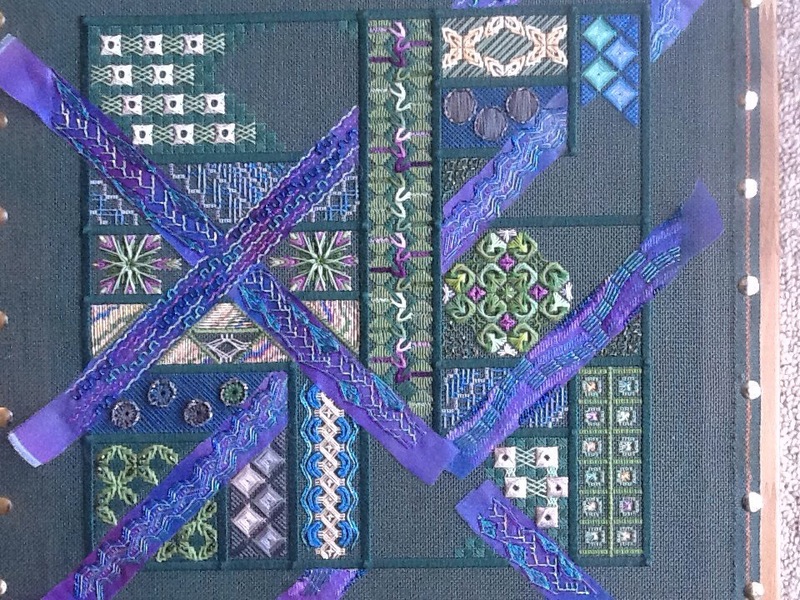 This has been a cyber class with CyberPointers, a piece designed by Linda Reinmiller. And I am so pleased with how it is turning out. It has such a wonderful variety of stitching techniques, many of which I have tried for the first time. Some of them have involved cutting the threads of the canvas – scary!!!!!! But Linda is a great teacher, and was there to hold my hand LOL. Linda’s original was inspired by the area where she lives, so I took that idea for myself, and have based my colours on the South Island of New Zealand. I live in the North Island, but my husband and I had a fabulous holiday in the South Island. Ha – North Island, South Island …… We are so imaginative here in NZ. I still have to do the 3 diamond shapes that will fill those empty spaces – they are done on seperate pieces of canvas, and then attached to the base canvas; and I need to add some beads here and there. Each segment has the stitches as designed by Linda, but with my own colour choices. Perhaps over the next few posts I shall explain some of the segments and show you some photos that gave me the inspiration. 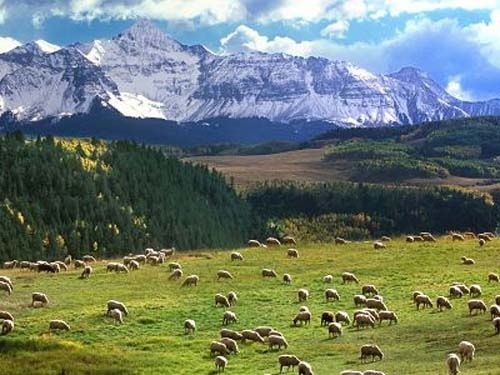 Here’s the first one – sheep on the hills of the high country – an area of high hills leading to the mountains, and home to some big sheep stations. think you should start blogging again, just set a goal of once a month or every two weeks and see how it goes. Write theblog ahead and keep a word file of blogs. So glad to see you back. Your project is great. I took a class from Linda a few years ago and learned quite a bit. Great to see you back blogging! I love the colors you chose for this piece. Mine is inspired by the Grand Canyon. I should get it out again – thanks for the inspiration! Yippee! So glad you’re back. I normally lurk, but always read your new posts, and I hope to see more from you soon. i would llove to get together with you. i am in stratford, and my mum and i did walk on the wild side with linda for four days in columbus ohio. she is the funniest teacher and so sharing in real life. mum has finished her piece and i am nearly so hope to have them framed for our regional exhibition at the end of the year.